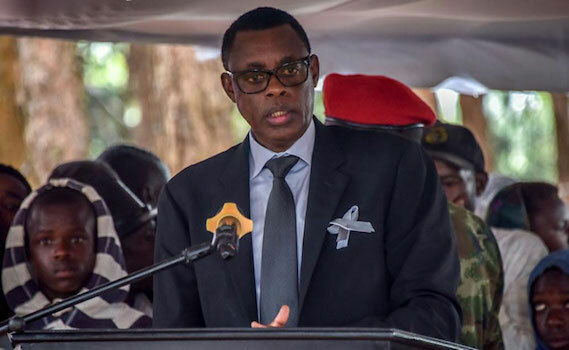 Defense Minister Gen. James Kabarebe has lauded the bravery displayed by genocide survivors in Bisesero during the 1994 Genocide against the Tutsis. He said the heroism and bravary is a great lesson for Rwandans, and in particular the youth. The Minister made the remarks on Monday after listening to testimonies by survivors narrating how they managed to unite and defend themselves against deadly attacks. “Bisesero has a great history, but that history has something to teach Rwandans, and the youth in particular. The bravery they manifested, even if they are dead, they were heroes, they defended themselves until they were killed,” Gen. Kabarebe said. “That is why many victims who had attempted to defend themselves, were eventually killed,” he said on Monday while addressing a crowd at a memorial site who had gathered to remember the victims. Abasesero are historically remembered for their aggressive resistance and unity. They fought hard and managed to contain Interahamwe raids by using stones, speares and other rundimentary weapons from the hills. “We vowed not to be killed like ants… we decided instead, to come together as one; children, adults, and the elderly, and defended ourselves as one people,” Aron Gakoko, one of the survivors said at a gathering when the area was paying tribute the victims. However, Abasesero were defeated and killed after French soldiers showed up promising them protection against the militias only to lure them into the killers. Over 60,000 Tutsis were massacred in the area.